It has just been announced on Newark CAMRA’s website that Just Beer has won the branches’ coveted Pub of the Year award for 2014 – the third year in a row. We are absolutely delighted to have taken the crown for a third consecutive year – the first pub to have done so since the competition started. Just Beer beat five other pubs in the running this year so we are especially delighted to receive the top accolade once again. The Four Tapsters are, of course, ecstatic at the news and would once again like to thank everybody involved: Our customers, Newark CAMRA, our Mums and Dads, the assessors, their Mums and Dads, whoever nominated us, Ninkasi (Goddess of Beer), the Baby Jesus, Princess Diana and Bonn Scott. For those about to drink, we salute you! Thank you all! There will be an official presentation of the trophy sometime soon, so stay posted for the date and other exciting news. It has just been announced on Newark CAMRA’s website that Just Beer has won the branches’ coveted Pub of the Year award for 2012. JBs and eight other pubs were in the competition this year so we are especially delighted to receive the top accolade. 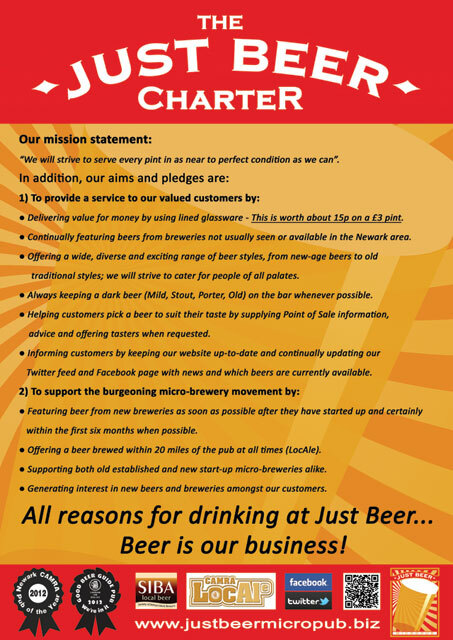 The Four Tapsters are over the moon at the news and would like to thank everybody involved: Our customers, Newark CAMRA, our Mums and Dads, the assessors, their Mums and Dads, whoever nominated us, Ninkasi (Goddess of Beer), the Baby Jesus and Princess Diana. We salute you all. Thank You! There will be an official presentation of the trophy on Saturday 18th February at 2.00pm. Everybody is welcome and there will a few treats, so please come along!